Over three days in June, a total of 55 equines—37 donkeys, 10 mules and 8 horses—were seen and cared for by the Animal Action team in the following areas: Vroutsi, Arkesini, Kolofana, Langada, Tholaria, Ormos, Chora and Katapola. During the program we were informed about an unwanted old mule (40 years old) that the owner no longer wanted. The mule had broken his hip, which fortunately healed, but prohibited the mule from continuing to work. So for his retirement, the mule will come to AZI’s stable and we welcome his addition. The team also examined a two-year-old stallion who was kept with his legs tied together. This practice of tying the legs is seriously detrimental and can permanently damage the legs. Instead, the team offered advice about a better way to tie a horse, using a halter and collar. A halter and collar was bought for the owner, and we hope that he will use it and that the quality of life of the horse will improve. The residents of Amorgos have embraced the program and they eagerly await the annual visit of the Animal Action team. We want to thank Animal Action for sending the team: Michali Gagani, a veterinarian specializing in equines, the farrier Gianni Mprastiano, our volunteer Lea Voegeli who offer us great help, and Panagiotis Psychogios (the Pensione Panos) who hosted the vet. A big round of thank yous also go to the owners of the many animals who participated in the program. Stage Two of the Aegiali Project has been completed. A total of 193 cats were sterilized in a week. We thank The Stavros Niarchos Foundation for their generous support and all of the people, especially our two vets and the volunteers from PAWS Chicago, who have helped make it a success. Thank you!!! In February, during the week of Feb 9th, AZI conducted another one of our spay/neutering programs on Amorgos. We were hoping to do about a hundred cats but the weather worked against us, with four of the six days being very stormy, full of strong winds, rain and hail. Catching cats in the rain is a huge challenge as you can imagine, yet we managed to catch and sterilize 68 cats (36 females and 32 males), with only 25 cats coming from Aegiali. That is a success considering the difficult conditions. We'd like to acknowledge Dr. Alice Degleri and Litsa Passari for their the hard work & dedication to the program. Thank you! We are currently organizing for a 2 day free spay/neuter program for stray cats. It will be held the weekend of November 8-9 at the rural veterinary clinic οf Chora. Volunteers are needed. If you are available, please contact info@animal-zone.org. Volunteers in Aegiali: Anastasia Voulgaridi (second from the left) and Efi Pavlidou (third from left) with the teachers from the schools. We want to thank all teachers for their hospitality and especially the director Maria Anagnostou (fourth from the left) who opened the doors of the schools with great willingness. In honor of World Animal Day (October 4th), AZI's Program Coordinator Litsa in collaboration with the Filozoiki organized visits to all kindergarden and primary schools of Amorgos, in order to teach children sensitivity toward animals. In addition to lessons in the classroom, the visits included activities such as games and a short film. Also, there will be an essay contest for the older children and an art contest for the younger ones with the theme on animal rights and animals as our friends. We look forward to receiving the entries! The Greek Animal Welfare Fund/Animal Action Greece equine team will return to Amorgos on June 9 & 10, 2014. The team, invited and partly sponsored by AZI, consists of a veterinarian and a farrier who will offer their services for working animals (the donkeys, horses, mules) of the residents for free. On June 9th, they will be in Kat Meria and Katapola. On June 10th, they will be working in Aegiali and Chora. Last year they treated 48 animals in total. We hope this year will be as great a success! (bottom) Meeting with the Mayor. From left: Mayor Nikita Roussos, Paola Mieli, Paula Fasseas, Litsa Passari (AZI's Coordinator in Amorgos), and Dr. Angeliki Degleri (AZI's vet in Athens). On June 19 & 20, 2013, GAWF (Greek Animal Welfare Fund) made their annual visit to Amorgos. Veterinarian & farrier team Eliza Geskou and Giannis Brastianos treated 32 donkeys, 4 horses and 12 mules. This year many new equines were treated on the island in addition to the animals sheltered at AZI's stable. In general the body conditions of the animals were found to be good. Most needed routine dentistry and farriery care. A few cases of fly-bitten legs were seen and treated and insect-repellent medicine was given to all equines. It was a successful visit. They could follow up on cases from previous visits in 2012 and 2011, and also treated many new equines in new parts of the island. We were very pleased with the turnout. Thank you, GAWF! A Successful Return to Amorgos! 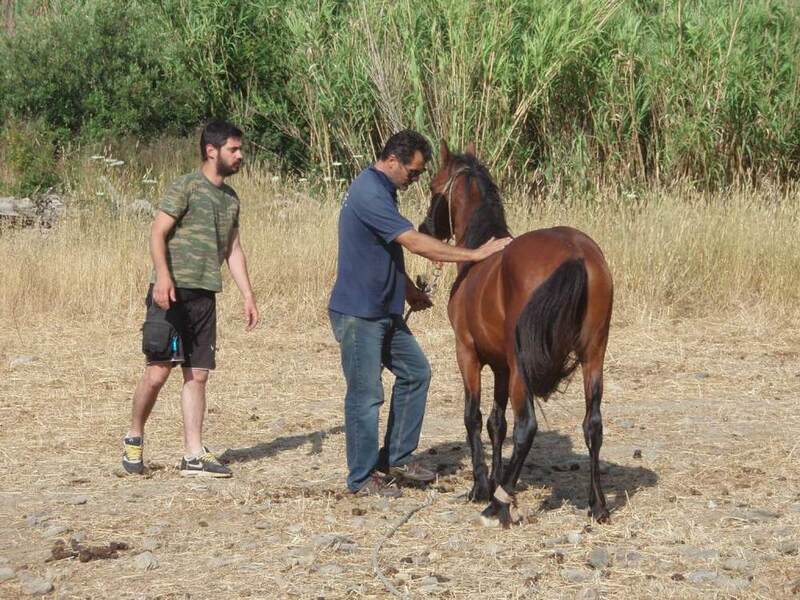 Elisa Geskou, the vet, and Jiannis, the farrier from GAWF (Anglo-Hellenic Animal Welfare Organization) returned to Amorgos at the end of May and stayed 2 days. Their visit was very successful! Last year they treated 17 animals. This year they treated 34!!! Many farmers responded to the invitation extended by Philozoike to bring their animals to be treated by professionals, especially in the area of Aigiali (the northern tip of the Island) ,where the team was working for the first time. Various cases of skin mange, bacterial skin infection, horseflies (a big problem on the island) and ticks on equines were found and treatment was given. Owners were given advice about how to use insect repellents to keep the flies from bothering the animals. In our shelter, where we now have 2 donkeys and a horse, they treated our donkey Daisy who was suffering from a skin disease and also seemed to have a very rotten tooth which was pulled. She is now a much happier old donkey. Her skin is healing and she put on some weight: she is finally eating regularly. The hooves of all the sheltered animals were trimmed and they all got an anti-fly medicine. We are very grateful to all people who made this possible. First of all to Elisa and Jiannis of GAWF for their patience and all helpful counseling. Many thanks are also due to to Maria, the local veterinarian, for her assistance, and Evangelitsa Passari, who will soon be working as the AZI program coordinator in Amorgos. Last but not least wish to thank Nikos Vassalos, Panajotis Psichoios and Vangelis from Eligryson for offering rooms and breakfast! GAWF members will return to Amorgos next Spring. The team travelled 9 hours on the boat to arrive to Amorgos on Tuesday the 29th, at 02.30 in the morning. We started our work in the north part of the island on the first day and in the central and south on the second day, both days working until dark. We treated 24 donkeys, 7 horses, 7 mules and a baby goat with a skin injury. A big problem on the island are the flies biting the body of the equines, especially the legs of the donkeys, therefore we showed the owners (that hadn’t met us last year) how to use the insect repellents. Various cases of skin mange, bacterial skin infection, horseflies and ticks on equines were found and treatment was given. A sarcoid was found on a horse and advice on how to treat it if he wants was given to the owner. Routine dental and farriery treatment was offered to all the animals needing it. Big hooks and overgrown feet were rasped back to normal, relieving the mouths and legs of the animals. A very rotten tooth was extracted at one of the very old donkeys rescued by the local welfare group. Last year we had trimmed the very long feet of a retired donkey in Chora that could barely walk and had given analgesics for long time in order to alleviate the pain coming from the foundered feet. This year, the same donkey arrived to have his long feet trimmed again, but he was a much happier donkey walking without pain. Amorgos is another island (like Naxos and other neighboring islands) where hobbling is used on animals, in order to keep them confined in one area and not escape. Once again we informed the owners about the dangers of hobbling and tried to advise new ways of tethering an equine; to the old ones that don’t change their habits, we tried to convince them at least to use soft materials and place them on parts of the leg where they can cause less damage. During the visit, Giannis also had the chance to show ways of training and riding horses to some of the young boys of the island who own pleasure horses and are not able to handle or ride them properly. This is not usually part of the Equine Team’s work, but having a properly trained and ridden horse makes a happier and healthier horse - which is our aim. Anna from the local welfare group rasped some feet under the guidance of Giannis. The equines that they have rescued need some rasping all through the year, so it was a good opportunity for Anna to learn how to keep them trimmed if needed. The team had been invited by the local welfare group “Filozoiki Merimna Amorgou” and Anna and Vasilis Apostolakis. Litsa Pasari from the welfare group and Maria Despoti, the local vet, were with us during our work around the island. We would like to thank all the above for the organizing and their hospitality, as well as Ioanna and Nikos Vassalos and also Panagiotis Psychogios, member of the welfare group, for offering us the accommodation. It was a successful visit following last’s year’s visit, as we managed to treat most of the equines treated last year, plus many more new in other parts of the island, therefore keeping the promise we had made before leaving the island last year. It has been a transformative year in Amorgos. Oursponsorship of a local veterinarian has changed the life of many animals and of many people who depend on them. This generated much support and interest on the part of the community. New attention has been given to the animal health and well-being. We sponsored Dr. Despoti’s internship in one of the most prestigious no-kill animal shelters in the the US, PAWS Chicago. Since her return in March, Dr. Despotihastreated various animals in need and sterilized and released over 30 stray cats. It seems a small step but it makes a huge difference. And through these little steps we are transforming a way of being. We thank all of you for your help and we count on your contributions to continue. Without your help we would not be able to make all of these small steps come together to transform the fate of so many neglected animals on the island. Recently we were contacted by a tourist in Amorgos who noticed that cats were being fed in a dangerous road-side position. We greatly appreciate being informed of any maltreatment of animals witnessed on the island. We count on your continuous support. A small action can make a huge difference in the life of many animals and the environment in which they live. GAWF is a London-based organization that strives to bring about significant and lasting improvement to the treatment of animals in Greece through a special program offering professional support in effort to help local animals. One of our local volunteers contacted GAWF to come and visit Amorgos and help us to improve the live of the horses, mules and donkeys there. We were pleased when they responded positively with interest in our request. In cooperation with Elisa Geskou who is a vet working for GAWF as a volunteer, wearranged a visit to Amorgos in the end of May, after their yearly visit to the island of Naxos. They arrived on the May 29th to work on the south part of the island, close to Kamari to help the animals from the surrounding villages. The following day they were at the port of Katapola where AZI's horse and donkey live at the new stable. The GAWF vets treated 17 local equines with farriery (hoof care) and dentistry as well as applied treatments to protect the equines from flies (a big problem in the summer months). One donkey was in such bad need of hoof trimming that he could hardly walk. Our vet Dr. Despoti assisted, and of courseall of the treatment, advice and medicine was free of charge. All of the farmers were very satisfied with the visit and we are very pleased with the level of participation.